The green dotted line, in this map from the Federal Rails Administration Tier 1 Final Environmental Impact Statement, shows where the FRA thinks the railroad line of the future should be. Red circles are hazardous materials. NORWALK, Conn. – A federal plan to increase rail service in the Northeast corridor would add a rail line through Norwalk and it’s immediately surrounding communities. State officials say it will never happen. 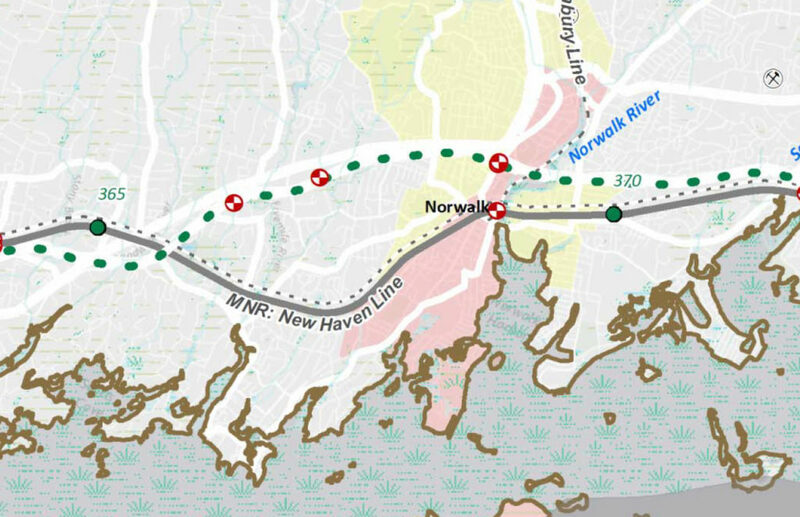 “The FRA’s (Federal Railroad Administration’s) report released today continues to ignore strong and consistent concerns expressed by the State of Connecticut and local citizens about the eastern shoreline realignment plans. … By continuing to include plans to bypass the current route, the FRA has enflamed impacted communities stretching from Fairfield County to Stonington where the proposed alignment will eviscerate neighborhoods, historic landmarks, and real estate values,” a statement released Friday by Gov. Dannel Malloy, Sen. Richard Blumenthal (D-Conn.), Sen. Chris Murphy (D-Conn.) and U.S. Rep. Joe Courtney (D-Vernon) said. The plan’s goal is to improve connections and reliability, eliminate chokepoints and “dramatically increase the number of trains and improve the railroad’s performance,” FRA states on the project’s website, NEC Future. This would involve having four tracks along most of the route. “Trains would operate frequently with improved connections, greatly enhancing travel options. Travel time would also improve. This vision reflects public preferences and is supported by the FRA’s analysis,” the website states. Mackay included a link to an appendix that contains route maps. Connecticut maps begin on page 22, Map 14 and run through page 28, Map 20 for the coastal route. The map for Norwalk is on page 27. “There are major potential impacts to Fairfield and New London County communities. The proposed coastal bypass between Old Saybrook, Old Lyme, and Stonington, is included in the plan, with the modification of a tunnel rather than aerial crossing of the Connecticut River. “Additional concerns for CT communities include new corridors for high speed trains in Greenwich, Cos Cob (new river crossing), Riverside, the west and east sides of Stamford, Norwalk (new river crossing), Westport (new river crossing) and then fifty miles of new route starting in Old Saybrook. “The Tier I is illustrative and does NOT specify the exact location of the tracks. The location and construction type of new segments (underground, overhead, at-grade) will be determined in future, more detailed (Tier 2) project studies with local and state governments–if they want to move forward as noted above. “We specifically asked FRA to limit the NEC Future Tier 1 EIS to identify a service and investment strategy to achieve state-of- good repair and maximize the capacity, frequency and speed of existing rail lines,” the state politicians said in their joint statement. Blumenthal was emphatic at a Friday press conference that the plan will never be approved, CT News Junkie reports. The FRA is now in a 30-day waiting period and may amend its recommended alternative based on public feedback. NORWALK, Conn. – A federal plan to increase rail service in the Northeast corridor would radically change the way trains make their way through Norwalk. Will CT approve any plan to bring our mass transit into the 20th century as compared to other modern industrialized nations? Nancy, it looks to me that the plan calls for a second line through Norwalk, north of the present Metro-North line. And of course, a new river crossing. The view I looked at was on Map 15 (p. 23). We definitely need a clarification. And think of the potential impact on local plans for renovation and improvements, not just rail. I heard of the changes in East Lyme several months ago, and that little town brought out some 500 protesters at a meeting held to explain the plan. Is that why we have not been informed until now about this new fed proposal? Modern high-speed trains sound like a good idea, but there ought to be a better way than to eviscerate historic communities. If this plan is followed, the $1Bn Walk Bridge would become a white elephant, no? I understand the strategy of building rail lines further inland to increase resilience against rising sea levels and coastal erosion, but don’t we need to coordinate both short-term and long-term investments to avoid wasting money on infrastructure that will be obsolete before it earns out the investment? Awaiting City Hall’s response to the Fed’s Plan. Also response to the Walk Bridge. Add in Manresa and lots of work for City Hall. Could be an opportunity to display “management skills”. I think it is important to note that Parson Brinkerhoff is the consultant on both the Walk Bridge and the FRA plan. It is weird that somehow this FRA plan advanced without Parson’s refoerecing it in the Walk Brodge project and notifying anyone in Norwalk that there was a significant change in the proposed rail line. I am now told that this would be an additional line. Story amended above. Think of all the homes that would be confiscated in the northern part of the City with a new rail line. That would make the City’s already punitive property taxes fall on even fewer home owners. And devalue homes near the new rail line. Looks like a winning solution to everyone except homeowners ! How many billions will be wasted just studying this before driverless cars make it obsolete? Driverless cars will make traveling on the road much quicker and safer. Commuters will opt to not use the train when widespread adoption of driverless cars and busses occurs. Ed, there will still be traffic congestion with driverless cars. You can only squeeze so many cars onto a road even if they are only 25 feet apart. Mass transit will always move more people around at lower cost and energy consumption.